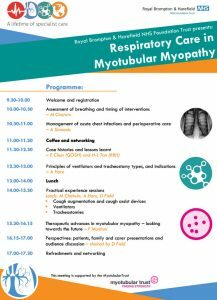 Royal Brompton Hospital arranged a respiratory masterclass day for myotubular and centronuclear myopathy on 17th January 2018. This event was primarily targeted at updating NHS medical professionals but patients and their carers were also made very welcome and contributed also to the day. The purpose of the event was to share best practices and new information on managing MTM/CNM to as wide an audience as possible. 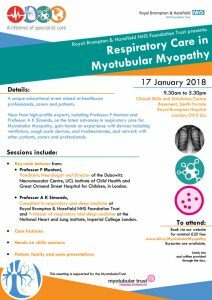 Professor Anita Simonds – Consultant in respiratory and sleep medicine at Royal Brompton & Harefield NHS Foundation Trust and Professor of respiratory and sleep medicine at the National Heart and Lung Institute, Imperial College London. The day also gave everyone an opportunity to gain hands on experience with devices including ventilators, cough assist devices, tracheostomies and network with other patients, carers and professionals. Feedback from the day will be published in Respiratory Journals, and linked into here once available.We would like to thank everyone involved in this day, and to Dr Alana Hare at Royal Brompton & Harefield NHS Foundation Trust for arranging it. PreviousChristie & Co raises over £35,000 for Myotubular Trust in 2017!